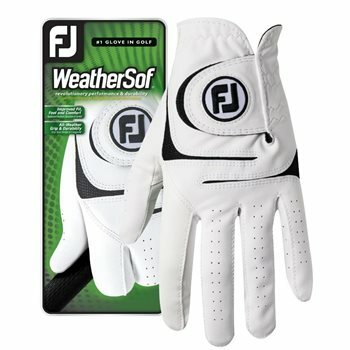 The FootJoy WeatherSof glove is the #1 selling golf glove in the world and combines revolutionary performance with maximum durability along with a consistent soft feel. The advanced Performance Leather increases the feel, durability, and grip performance in key stress areas while the breathable elasticized PowerNet™ Mesh along the fingers and knuckles create cool comfort while improving fit and flexibility. The WeatherSof glove features an exclusive FiberSof material, a proprietary ComforTab Closure for a secure, reliable fit and feel and soft PowerNet mesh across the knuckles for improved breathability, comfort, and flexibility. As advertised. Good fit and good value.